Cyclists in the City: Could central London be about to get its first ever bicycle-friendly link? Crown Estate proposes north-south route linking The Mall to Regents Park. Please voice your support (see below). 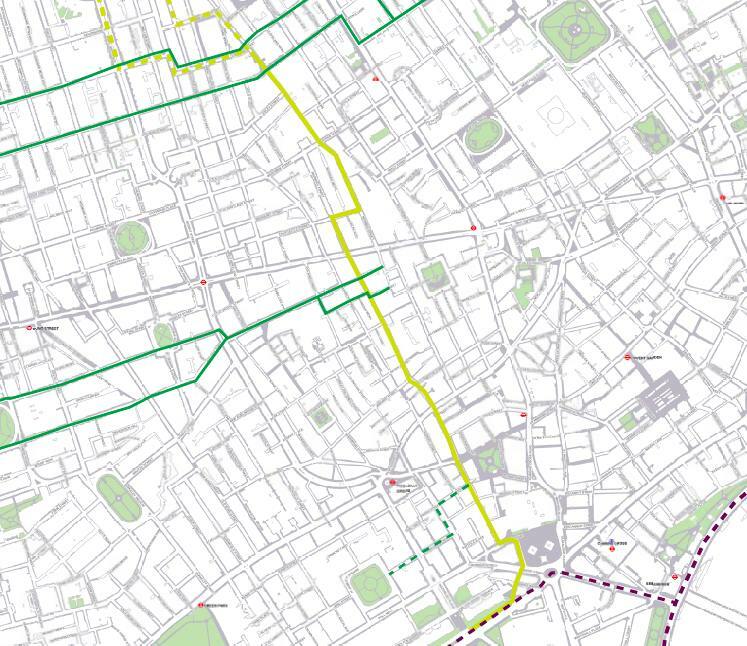 Could central London be about to get its first ever bicycle-friendly link? Crown Estate proposes north-south route linking The Mall to Regents Park. Please voice your support (see below). Last month, I blogged about the proposals to turn Haymarket and Lower Regent Street in the West End of London into virtual no-go zones for people on bikes. The plans, sponsored by the Crown Estate - which owns much of the property in this area - and delivered by Westminster Council would massively reduce carriageway widths, giving the space over to huge pavements. The already awful conditions for cycling in this area would be rendered even worse. The scheme would also make conditions significantly worse for millions of bus passengers on these very busy routes - a point not lost on the Evening Standard. 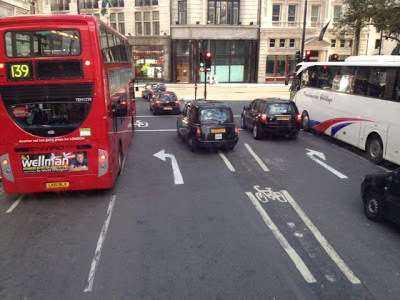 Cycling on streets controlled by Westminster council is a largely unpleasant experience. Unlike the rest of inner London, this is where motor vehicles reign free. Bike routes are little more than blue signs, often on multi-lane, fast and narrrow one-way streets. The plans at Haymarket are emblematic of the way Westminster has marginalised bicycle-friendly links in favour of pumping motor vehicles through the centre of London. In short, the Haymarket plans caught the imagination of very many people who are fed up with Westminster council's approach to cycling hitherto. One of those people might just be Lord Berkeley, secretary of the All Party Parliamentary Cycling Group. Lord Berkeley very kindly asked the government (given that the Crown Estates Commissioners report to Parliament) "what assessment they have made of the impact of [the Haymarket] plans on the space available for buses and cyclists?" The response was not exactly encouraging: "This is a matter within the competence of the Crown Estate in which the Government do not propose to intervene". Roll on a few more weeks, however, and the Crown Estate decides to make its voice clear. 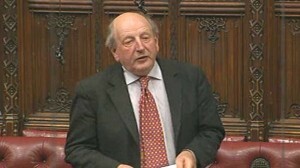 In April, Peter Bourne, development manager of the Crown Estate (which is, after all, the sixth largest landowner in the country) responded to the many people who had protested the Haymarket plans with these very encouraging words: "Cycling is good for business" and "We agree with you that what cyclists really need are safe and segregated cycle lanes as suggested by the Mayor in his ‘Vision for Cycling’"
It took the eagle-eyed Secretary of Westminster Cyclists, Dominic Fee, to spot a freedom of information request based on this blog and asking the Crown Estate to clarify its commitment to cycling. That FOI request was made by Jon Stone. Jon, I don't know you but I congratulate you on getting this far. The Crown Estate has obliged by sending a very detailed overview of its (very early stage) plans. The response includes some detailed drawings of the proposed scheme and a lot of detailed description. It is very, very exciting. First and foremost, though, is a major caveat. And that is this comment: "The Crown Estate is a substantial property owners in St James's and Regent Street but has no powers to implement anything on the public realm other than with the agreement of the highway authorities". Those 'highway authorities' are Transport for London and Westminster council. My sense is that TfL is very supportive of these plans. My hope (and it is only a hope) is that Westminster council will be able to support them too. There is a very detailed map of the planned route available. cycle lane. The route crosses Pall Mall East at the same point as the existing signalised pedestrian crossing and along the north side of Pall Mall East to Whitcomb Street. It then follows Whitcomb Street and Wardour Street, with a signalised crossing at Coventry Street, Shaftsbury Avenue and Oxford Street. Otherwise it has priority at other junctions. We are currently looking at feeder routes into St James’s and Mayfair." I have plenty of thoughts about the route, not least the fact that it still isn't clear what is happening at Haymarket. But my overall feeling is that this is very encouraging stuff and it is extremely clear that the Crown Estate has been encouraged by Andrew Gilligan, the Mayor's cycling commissioner, to believe that Transport for London will back (and possibly help finance) the plan. Central London desperately needs bicycle-friendly links. A north-south link would be an incredible start to the Mayor's planned inner London bike grid. As I say, however, it is very early days. The scheme is by no means set in stone. The Crown Estate has this to say: "We have had initial discussions with the Mayor’s Cycling Commissioner and Westminster’s Traffic Commissioner and they are very supportive and guardedly supportive respectively." My suggestion is simple. Many of you wrote to Westminster and the Crown Estate to object to their Haymarket scheme. Perhaps now is the time to write to them again in support of this proposed north-south bike link. If you live or work in Westminster, you can easily write to your councillors by using the Write to Them tool. The Crown Estate, 16 New Burlinton Place, London W1S 2HX. Good luck and thank you to everyone who is helping to make these changes become reality. This is campaigning at its best. Well done and keep the pressure on. This looks like a really sensible route - when I worked on Wimpole Street I would use this route to get there, and the only annoying bit was having to get off and walk from Whitcomb to Wardour Street because of the one-way system. Joining this up with a contraflow makes for a much more coherent route. This would make my ride home in the evening so much more pleasant. Currently do a wibbly wobbly route from Trafalgar Square to Regent's Park via back streets to avoid the hell that is Regent's Street. I'd strongly encourage *anyone* reading this to take up Cyclists in the City's suggestion to drop those listed above with the power to make decisions about this an email and keep the pressure up. How predictable that the representative from Westminster was guarded. Previous form suggests they're just waiting for the first opportunity to shoot this down - hopefully we can pile enough pressure on to make then think twice about trying to duck out.